We always accessorize ourselves, so why not accessorize your pet! With these black pet shirts, your sweet furry family member will never go unnoticed again. These 100% cotton shirts are a soft and stretchy material. They are easy to slip over the head of your cat or dog. They have openings for their head, two front legs, and the back end of their body. Each opening has a beautiful finished trim. The back of these shirts are printed with your choice of a full color content i.e graphics, graphics & text, multi-line text etc. They come in 5 different sizes: Small (10" x 7"), Large (13" x 8.5"), X-Large (17" x 9"), 2X-Large (20" x 20"), and 3X-Large (22" x 22"). Be sure to try your best to measure your dog or cat's back in order to find the best fitting size. Measure their back from the base of their neck to the base of their tail and add an inch or two for comfort. Then measure the width of your furry friend. Have a blast picking which design to use for your pet's shirt! Pick an adorable graphic or quote from our system or upload your own! The possibilities are endless. If you have any questions about our products or design center, please don't hesitate to contact us. Talk to a real person on the phone or our online chat. We are always happy to help. Love this product? 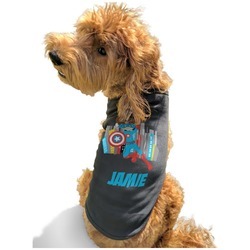 Check out the rest of our personalized pet bandanas, pet tags, and other fabulous pet accessories.